There are many factors that contribute to the success or failure of direct selling companies. The compensation plan is one of the biggest. The companies who achieve long-term success have a sound plan. Plans that are not well designed and consequently fail to motivate distributors can become a brick wall to company growth. The fact of the matter is few companies seem to really grasp the art of compensation. To create the best, custom compensation plan for your company, you need to understand the foundation principles. Let’s talk about the basic principles of success common to virtually all successful compensation plans. The pricing methodology of a company’s product line has a lot to do with its payout. There are a lot of pricing-related issues that you need to consider and decisions that you need to make. All the characteristics of the compensation plan flow from these decisions. In today’s network marketing companies, two prices are discussed: Wholesale Price and Retail Price. The wholesale price is the price distributors pay for the product. Retail is the price customers pay for product and it’s typically 25% higher than the wholesale price. Companies choose either the retail or wholesale price as their “base” price. Party Plan companies generally employ a retail-based pricing method; distributors sell to customers at retail and take the difference between retail and wholesale as profit. Network marketing companies typically use a wholesale-based pricing method. How does a company pay its sales force for the behavior it desires? What percentage of your profits should you pay out? How much can you afford to pay out? For $1,000 of product sales, should the payout be $60? $100? $200? The commission payout standard in the industry today is 40-45%. Most companies want to pay the 40-45% in commissions, and the rest in incentives like car programs and trips. That is the percentage payout of the wholesale dollar—the money that comes in from the distributor. Variance from the payout standard brings predictable consequences, which you should carefully consider. If your company promotes a plan paying only around 20% commission, it may have a hard time recruiting and keeping distributors. 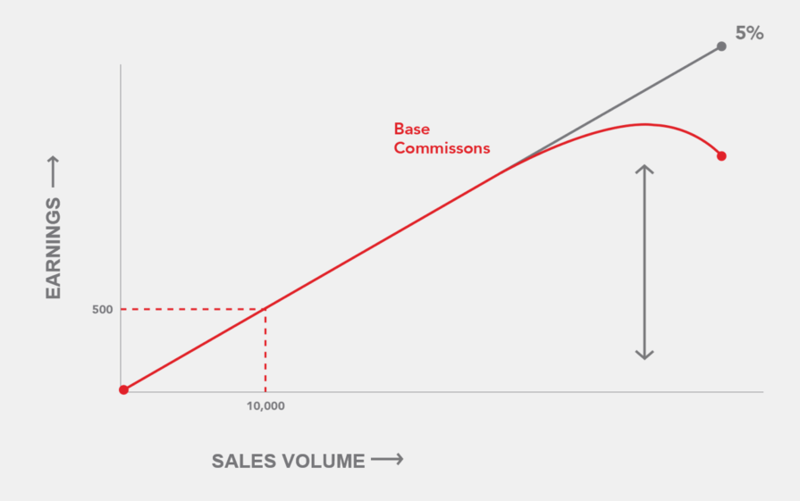 If you’re going to pay more than 45% in commissions, you need to know where that money comes from. You need to know what budget cuts you’ll have to make to achieve that. Some companies go up to 50%. But when you start going much higher than that, it’s very hard to sustain long-term profitability. The higher percentages are possible with high product margins. When determining the percentages you’re going to pay, it’s a good idea to think about your theoretical payout. Theoretical payout is the percentage the plan would pay if all commissions were paid out in every case. The theoretical payout should not be more than 8% above actual payout to avoid disappointing distributors expecting more. How do you distribute the standard 45% commission? The standard is to pay individuals 5% of their downline volume, but you can’t pay a 5% commission to all upline distributors. A distributor might have a 50-person upline. If the company paid 5% to everyone in a 50-person upline, the total payout would be 250%! You must determine how far into the upline you’re going to pay. 5% commissions. You can pay 5% to 9 people in the upline for a total of 45%. 10% commissions. You can pay 10% to 4 people for a total of 40%. 20% commissions. You can pay 20% to 2 people for a total of 40%. Some direct sales companies with minimalist multi-level compensation pay higher percentages to fewer people. But 5% is the most common percentage among ordinary MLMs. Obviously, the company must limit and decide which individuals to give 5%. What do most companies do? Today’s commissions are typically based on the 5% Plus Theory. Each upline distributor that receives commissions should receive about 5% of organization volume. A company must pay a higher percentage to the distributors who are critical to its growth and stability. If they build downlines, they will have some control over their destinies. If they build their downlines properly, they will get paid on most of their downline sales. First you need to determine the base commission. A base commission is the commission that’s standard across plans of the same type and it should get distributors up to the 5% line. This is the unilevel commission in a unilevel plan or the pay leg commission in a binary plan. 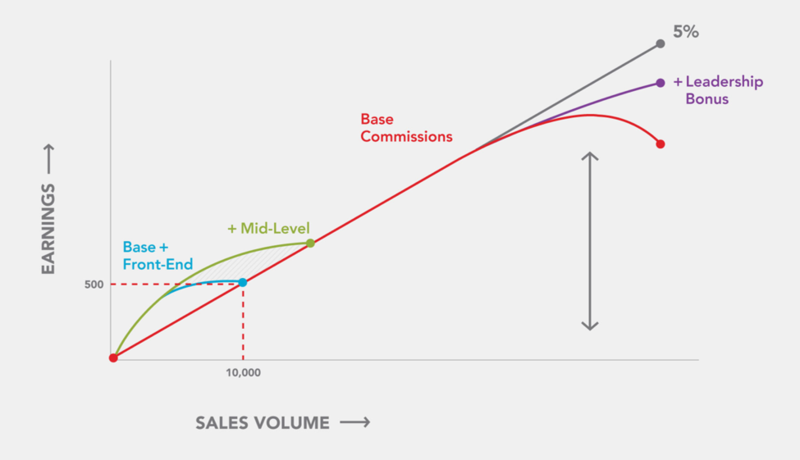 If you graph the relationship between total organization sales volume and total earnings, most companies’ base commissions create a 5% line with a downward curve at the top where the percent goes down to 1% or 2%. The problem with paying only the standard 5% is that a distributor generating $10,000 of sales volume earns only $500. Is this appropriate compensation for a distributor to earn on $10,000 of sales? If somebody other than that individual is making those sales, then maybe it’s appropriate. But, if a distributor is personally making those sales alone, he or she would be better off working at Walmart. The MLM earnings per hour are just too low! So, applying the 5% Plus Theory, you pay additional money to the distributors who are personally responsible for sales. These are the people you really want to incentivize. The challenge is to create a segment of the downline that can make a higher percentage. To accomplish this, you must hybridize your compensation plan by adding on additional commission types—like a fast start program or front-end commissions. Another commission you need to add to that 5% goes to the mid-level distributor. 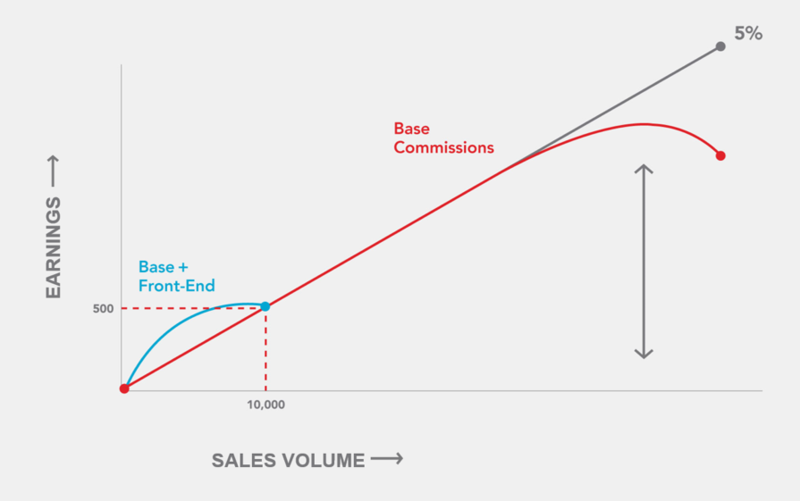 Many times we have seen flat spots in commission plans where a distributor’s earning percent drops off when the front-end commissions end. 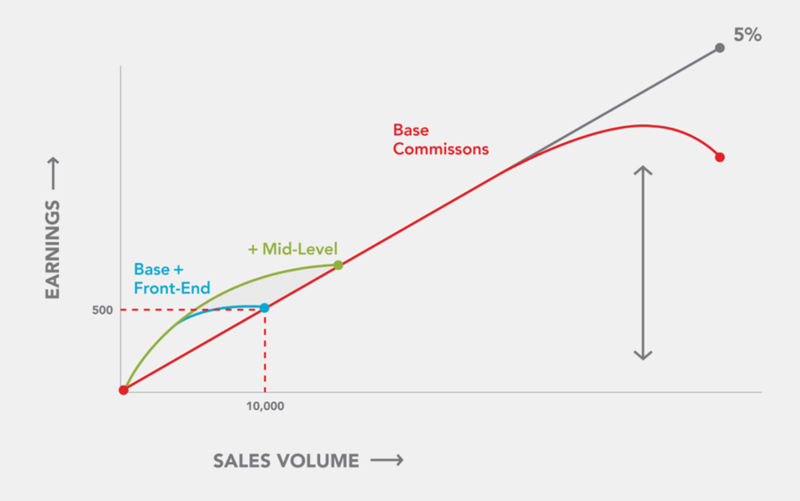 Mid-level commissions are designed to smooth out the transition between front-end and high-end commission. In other words, mid-level bonuses help bridge the gap for distributors transitioning between salesperson and sales leader. One popular tool for accomplishing this is a matching bonus. Finally you need to slow the drop off at the high end. 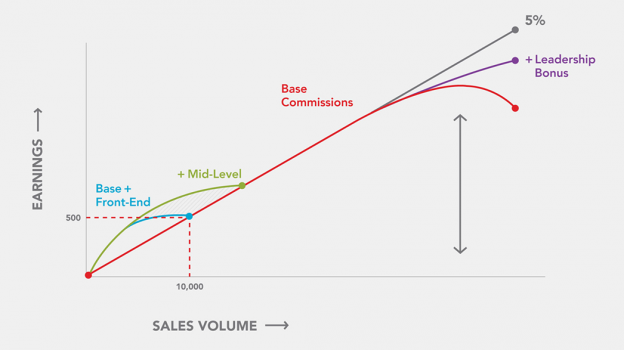 Most base commissions taper off to around 1% of organization volume at the high end. This happens because as organizations grow deep, the volume gets too far away from the distributor for them to get the base commission on it. Remember, you can’t pay everyone 5% and stay within the 45% total. To remedy this, you create leadership bonuses—high end commissions such as pool bonuses or infinity bonuses. Deciding how much to pay out and who receives the payout are critical decisions every company must make. A company needs to figure out the maximum payout at maturity. In other words, you will have to adapt your plan as you see how it pays out in your growing organization. Modeling a plan can help predict how it will pay out. Typically, a company decides on a total amount they want to pay based on the cost of the product and what they can charge for that product. After deciding how much to pay, companies decide on a base type of commission (such as unilevel, binary, or breakaway). Then the company adds front-end, mid-level and high-end bonuses to incentivize the new distributor, mid-level salesperson, and the high-end sales leader. The bottom line is that MLM corporate executives must build a plan that effectively rewards their active distributors of every type. A successful network marketing company must have a strong and flexible commission plan that pays and generates activity at every level of the company.